A Fresno firefighter is in critical condition after falling through a roof into a burning home. The house fire broke out just before 1:30 p.m. Sunday in Central Fresno. FRESNO, Calif. (KFSN) -- A Fresno firefighter is in critical condition after falling through a roof into a burning home. 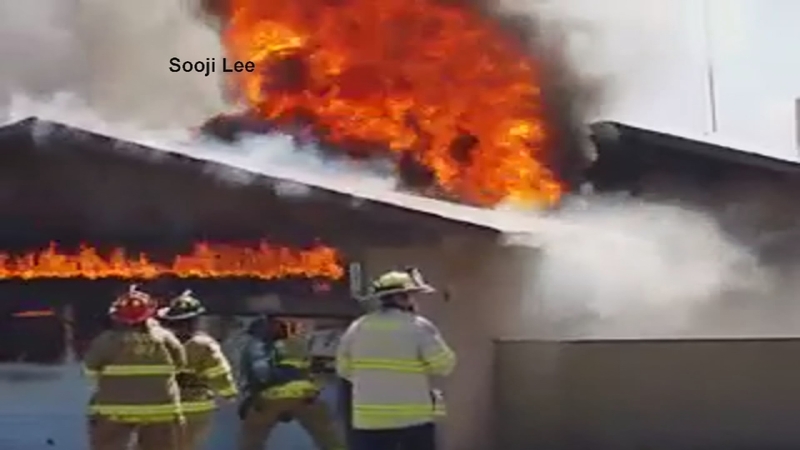 A horrifying moment as a firefighter crashes through a roof and is engulfed in flames. Harrowing screams from bystanders all caught on camera by Sooji Lee, who watched in disbelief. "I almost had an anxiety attack because we didn't know what was going to happen. I honestly didn't think he was going to make it," said Lee. The Fresno firefighter is a 25-year veteran on the force. Investigators say he was trying to put out a garage fire when he fell into the burning building. It took minutes for firefighters to tear the garage door down and free the firefighter out of the inferno. "Sounds from the public were traumatizing in and of themselves. We could hear people screaming. We could hear people running in, trying to help," said Fresno Fire Battalion Chief Todd Tuggle. Once he was rushed to the hospital, dozens of his colleagues stood by in a show of support. The video of the fire captain has since gone viral on the Internet, and Lee says she'd share it again in a heartbeat. "Just that way they know the kind of position that these firefighters are put in, and that they do brave things every single day," said Lee. It's a dangerous act that we call bravery, but firefighters call just another day at work. A member of the fire department says the fire captain has many more surgeries to undergo before they know the full extent of his injuries. Thanks to all who have reached out to FFD. This is a difficult time for all of us and our thoughts and prayers are w/our FF and his family. Per the request of the Fresno Fire Department, Action News is posting the raw video to show the dangers of firefighting.